Find a place where you can truly belong at TUMC. Various groups meet to fellowship, share ideas, nurture their faith and have fun. 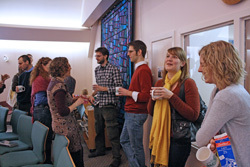 Some are Sunday School classes — for children and adults — that meet before the worship service. Other groups meet monthly, weekly or ad hoc. TUMC is also a place where you can suggest your own ideas about how to grow your faith, explore friendships, and initiate new activities. Send an e-mail to the church administrator at secretary@tumc.ca or phone 416-699-6631, to connect with any of these groups.